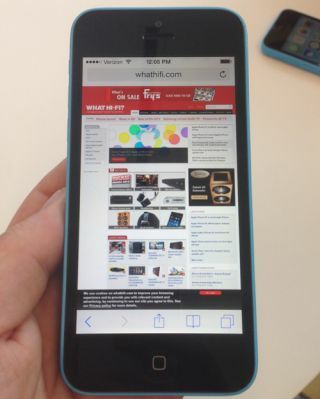 Hands on: Apple iPhone 5C review | What Hi-Fi? Take a look at the long-awaited, much-rumoured "budget" iPhone 5C. A cheap iPhone, it is not, but it is indeed, as the rumours tipped, a plastic iPhone. The idea of a plastic iPhone is a bold one – for a company renowned for its attention to design and build quality, it seems an odd move to go from a solid, aluminium bodied handset to plastic. However, as with many of Apple’s design decisions, this one looks like it might just have paid off. The iPhone 5C doesn’t feel like a plastic phone, and as the firm has gone to great lengths to explain, this is different. Rather like the M&S ads in fact, this isn’t just plastic, this is Apple iPhone plastic. The handset feels incredibly solid, thanks to a milled metal chassis that holds the plastic body. It feels solid, and easy to pick up – unlike some of the cheap, flimsy Android competition. The interesting thing is that the colours are also something a bit different – they really, to use a terrible American phrase, pop. Combined with the plethora of dotted covers, this is a phone designed for customisation, and one that is set to re-ignite the massive market in third party accessories. Technically, the handset is very similar to the original iPhone 5, and offers no real surprises – though the colour scheme of iOS 7 really does make more sense on the handset (even the wallpapers are colour coded to each hue). It's easy to use, and actually feels nicer in the hand than the flagship iPhone 5S in many respects – the rounded corners and solid feel give you a real sense that you could throw it about a bit without any problems (funnily enough Apple didn't seem keen to let us test the theory). The initial reports of the iPhone 5C were scathing, claiming the C stood for cheap. As Apple’s pricing has since proved, this isn’t a cheap handset – but it doesn’t need to be to sell by the bucketload, which we think this probably will. The iPhone 5C is a quality, and slightly different product – and after playing with it, it's easy to imagine the 5C becoming Apple’s biggest seller, and the most popular iPhone ever released. Mark Prigg is a science and technology journalist and the Evening Standard technology correspondent. He is reporting live from the Apple launch event in Cupertino and will be reporting from the event for whathifi.com.